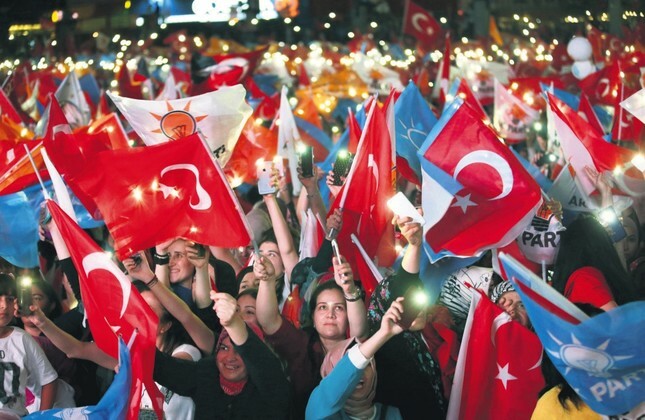 People hold Turkish and AK Party flags and celebrate Recep Tayyip Erdoğan's and the AK Party's victory in the June 24 elections, Ankara, early Monday. For the past few years there has been an extraordinary effort among the Western countries "to get rid of Recep Tayyip Erdoğan" as the leader of Turkey. Since 2010 Turkey has been going through turbulent events, all designed to topple the Erdoğan administration that peaked with the bloody coup attempt on July 15, 2016.It is strange that instead of condemning these incidents Western countries have either remained silent or reacted with great delays to the negative developments and have hardly displayed any solidarity with the Turkish government. Statements condemning the coup attempt have been half-hearted and have hardly made any impact. It seemed they actually wished Erdoğan would go but did not spell this out openly as they witnessed event after event that the Turkish government survived, and Erdoğan's national popularity increased. That became a widespread belief in Turkey after we witnessed how the Gülenist Terror Group (FETÖ) was given refuge in the United States and in some Western countries, led by Germany. The Western powers ganged up to encourage the people to reject constitutional amendments in Turkey in 2016 that would usher Turkey into a presidential system of government. A national referendum approved the constitutional changes with a 51 percent majority. Again the Western powers, as well as the Turkish opposition, claimed the referendum results were doctored, which was a load of nonsense. Despite all the adversities, despite Western efforts to block Erdoğan from rallying for the support of the Turks living in Europe, despite the highly adverse Western press coverage and perception campaign that Erdoğan would lose the elections, the president won a resounding victory by winning 52.5 percent of the votes in the first round of the presidential race against five adversaries, which is unprecedented in world democratic history. The fact that the president received a 52.5 percent mandate by the Turkish people to lead the country with a new presidential system also showed that national support for the system has increased and that the 2016 referendum results were indisputably the verdict of the people. So at the end of the day the Western powers that have geared their strategies of "getting rid of Erdoğan" have now seen this is a mission impossible. Erdoğan is here to stay, and this is the verdict of the Turkish people. It has not been imposed on the nation, the nation has displayed its free will! The Western powers have to see that this country is not Egypt. You cannot turn against the will of the Turkish people by staging coups and toppling elected officials. So from now on Western leaders have to start discussing how to cooperate with President Erdoğan and his administration. They have to see that Erdoğan, as the lead champion of the oppressed across the world, offers solutions to many of their problems, led by the growing problems of migrants in Europe. Turkey has become a power in its region and is thus calling the shots. Cooperating with Turkey has numerous advantages for the West, while turning against Turkey will only be self-defeating.